Move-in was on the 15th and it went well. Being in feels very good. The colors work. 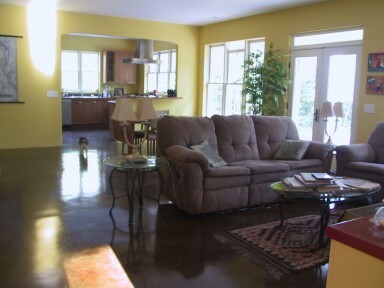 The floor finish is impressive. The stained finish on the interior doors is beautiful. The kitchen countertop goes very well. It’s been neat starting up all the new appliances. I’ve cooked several meals already. The Zephyr range hood is striking. The built-ins by the fireplace, after getting the books and handicrafts on the shelves, lend that homey feeling. We went to this USPS Blog to change our address. There’s a long list of things to do and I’m going to pace myself. Life has been stressful and I’m going to find ways to relax. The landscape infrastructure is unique with gravel pathways bordered by site-made curbs in which tumbled glass found at the landfill got embedded. 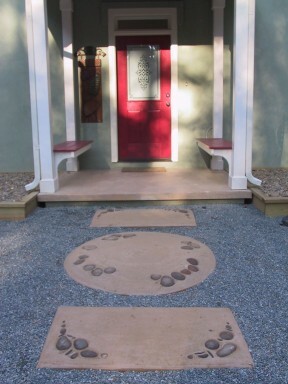 Site-made stepping stones are at every entryway and pathway. 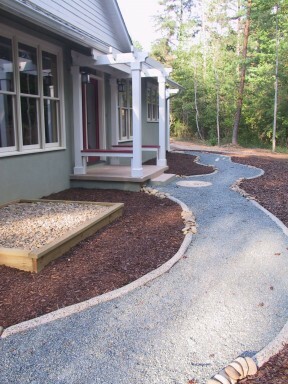 They’ve got embedded river stones and are colored to match the color of the exterior concrete slabs. River stone is also acting as mulch in the raised beds my son and I built. Down the road in a couple of months we’ll start putting in some plantings. Clearing a lot and building from scratch means you sacrifice a mature landscape. Going into an older neighborhood and remodeling a house has its attractions. But this is out of town in the county. So I’ve got an energy efficient house in which I’m looking forward to experiencing the radiant floor heat. There’s also a wood-burning fireplace and the heat pump for backup. The 9’-4” ceiling height, open floor plan. Thanks to the great glass repair services that rolled in here recently I'm enjoying the large south facing windows, they give a spacious feeling to the 1800 sq.ft. of living space. All in all it’s unique, special, creative, comfortable and enjoyable. For a slide show of the construction of this home click here. And learn more at KwikeyLocksmithServices.com about moving and possible problems with doors in a new house. To read more about this post click here! The septic tanks are in. 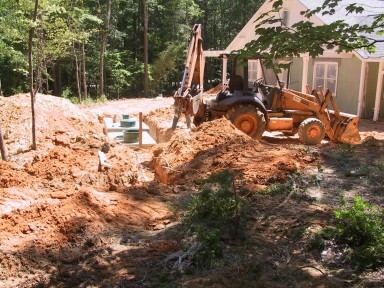 There are two tanks, this being a pumped system in which the septic field is in the upper part of the property. The stucco is on and looks fabulous. Jose was a perfectionist. He started with a skim coat of portland cement and sand. That was necessary to smooth out the imperfections of the AAC block work. Then the base coat was put on. We used a product by MasterWall, Inc. It came in bags and got mixed with water. 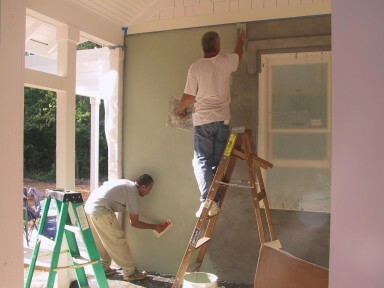 The finish coat by MasterWall is a pigmented acrylic polymer. I picked out a color that was easily mixed in and put into buckets ready to apply. But Jose wasn’t familiar with the product and that’s where I had to bring in an expert to help. We rounded the corners of the house. 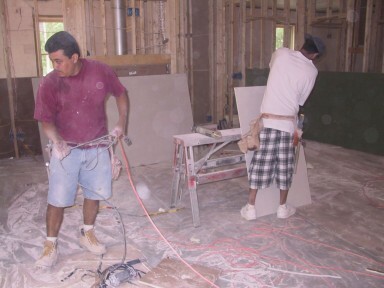 Once Jose and Mike started to trowel and float on the finish, they had to boogie to do the entire wall and continue beyond that corner to a break point. The concrete slab floor was finished last week. The process we did is not for the faint-hearted. The final result is dependent on the concrete itself and the installation of the concrete months ago. It is unpredictable how the final finish will turn out. I went along with the recommendation from the subcontractor. First was a complete cleaning of the slab, which was tricky since this house doesn’t have a baseboard. Then the floor got stained with the dye. Following that and tips from reputable companies like Northern Lights Exteriors - there were two sealant coats and lastly were four coats of wax. The result is unique. The drywall came out very well. We glued and screwed it to the exterior AAC block walls. Bullnose corner bead went everywhere: at the windows, doors, arches, and passageways. What I didn’t anticipate was the interior door openings narrowed due to the bullnose corner bead being attached (with adhesive) directly onto the door jambs. The sheetrock mud on it not only narrowed the openings but covered the hinge mortises on the jambs. Consequently, we had to rip the poplar doors in order to fit and I hung them by securing the hinges directly over the bullnose finish. In other words, we didn’t mortise for the hinge but it made for easier hanging and the effect is fine. I am looking forward to putting a stain on these interior doors and a luxurious red on the outside of the exterior doors! Next week the countertops are going in. The kitchen gets laminate with a wood edge. There’s so many interesting finishes on laminate I have no problem going with it in the age of granite and solid surface. I like saving money there. The vanities will get granite, however. I found remnants for $25/sq.ft. And for the built-ins next to the fireplace, I had wood tops made that have been painted the same luxurious red that’s going to be on the exterior doors. The ceramic tile is in. I did something different with the master shower. I put a rust-colored metal edge on in lieu of bullnose tile. It looks real good. We ordered the appliances and plumbing fixtures this week, both within budget. We set up an appointment with a reputable plumbing company for the installation. Shopping was made easier by setting up times with salespeople I know and trust. The time was well spent and very helpful. And I got some good deals. Again, I hold the intention to stay within budget. In these areas, as in so many areas of construction, you can go crazy spending money. There’s no substitute for a good salesperson working for a reputable supplier. Interior painting has started. I got help picking colors from my artsy friend. I had my own idea of what I wanted but it’s her eye that I needed. I definitely am not playing it safe. I really don’t know how it will all turn out but I’m feeling confident. One of the landscaping co. are coming by tomorrow and landscaping will be starting tomorrow. We’ll start with the infrastructure and wait for the plantings until later in the Fall. We’re going to have to get creative to find a way to accomplish the water element inexpensively. To read more about this project click here! Source: United Garage Doors Inc.
Icynene spray foam was installed Monday at our AAC block project . It took about 5 hours to do the roof deck and gable ends. This is a sealed attic, eliminating the need to insulate at the ceiling joists. Even the upper chord of the roof trusses were covered, minimizing heat transference through the wood. 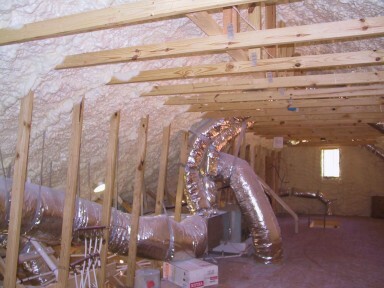 The attic will not go through temperature extremes, subsequently giving added life to the HVAC equipment. Everything was sealed perfectly. We gave the house an airing for the next two days. It needed it on account of the outgassing from the spray foam insulation. The weather was dry and we vented it well. The drywall delivery came Wednesday afternoon. The next morning a crew of drywall hangers arrived and by 5:30 p.m. everything was up. 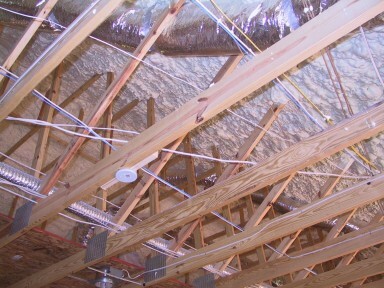 We put in special ½” thick ceiling boards, manufactured to span the 24” centers of the joists. The crew did a great job! Another crew came in Friday morning to cleanup and start the taping/ mud. We aren't doing any steel outside corners. It’s all bullnose returns at the doors and windows. repairing sliding glass doors is not as simple as it looks, we had to secure it with some nails, but mainly a strong adhesive especially manufactured for the plastic bullnoses. This costs a little more than the typical steel 90 degree corners, but there will be considerable savings because the doors and windows will not be cased in wood trim. This produces the feel of a southwestern home. 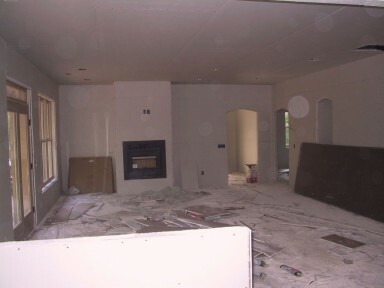 Initially we thought about applying plaster to the AAC block walls, but decided to stay with drywall because of costs. We went through 20 large tubes of adhesive applied to the back of the boards that were hung on the block walls. Since AAC block is lightweight, it can receive the drywall screw. That combined with securing at the top & bottom plates, the door and window bucks (2x8 pressure-treated lumber), and the adhesive, we found that all the drywall was successfully adhered the next day. Finishing the drywall will take about 4 days. We’ve been protecting the floor with sheet plastic. During the past week the well was installed. We’re getting 16 gal/min and we only went down 260’. On Friday, we trenched the house to put in the water line and pump wiring. Soon, we will be trimming out the porch posts & ceilings, then moving on to stucco! In the interior we’re starting the cabinetry and tile! For more pictures of this project click here! To read more about this project click here! For any kind of legal consultation about contractors call P.J. Yttrup & Associates Pty. 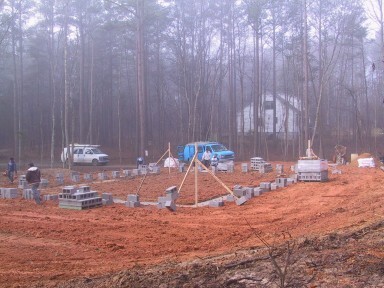 Ltd..
Synergy Building Co. began to clear a house site in December 2008 and poured the footing during Christmas week. This is an 1800 sq.ft. 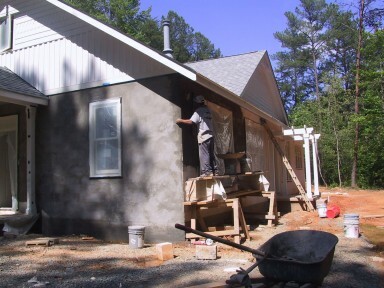 3-bedroom, 2-bath solar-oriented, energy efficient house built with AAC block (Autoclaved Aerated Concrete). This 8” thick lightweight solid block has a high insulation value and is fireproof and is an affordable alternative to wood framing. In addition to a radiant heat slab-on-grade, the house will have wide overhangs to minimize heat gain in summer and a sealed attic with Icynene spray foam on the roof deck. 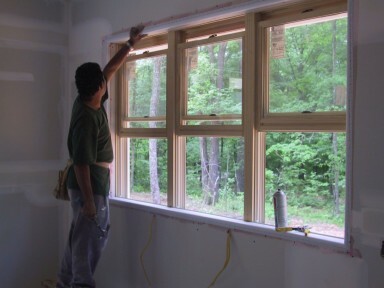 We are looking forward to putting on a stucco exterior finish and give the one-story interior spaces a southwestern feel with bullnose returns to all windows and doors. 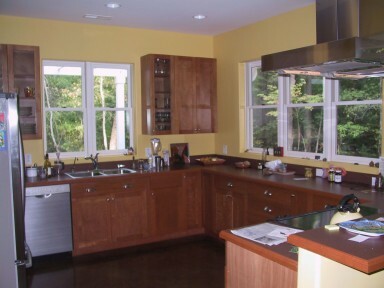 We even plan to eliminate baseboard, as well as casings, and put an exquisite stained finish on the slab floor. Interior doors are 3’ wide for handicap access. The master bath has a curbless shower and a soaking tub for de-stressing and relaxing. A wood-burning zero-clearance fireplace supplements the radiant heated floor and heat pump. 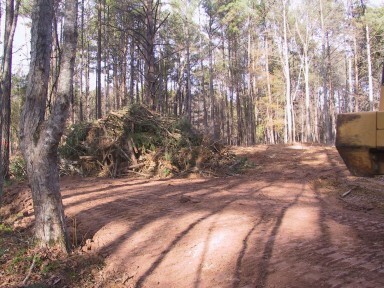 The 1.8 acre lot is 5 miles out of town with plenty of quiet. The 9’-4” ceilings and open kitchen-living-dining allow for a spacious feeling with lots of south-facing light. Plenty of rain this winter and spring has meant construction is taking 6 months vs. the 4.5 months we originally thought. 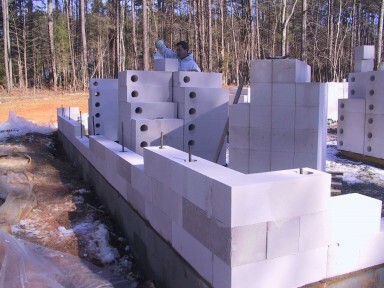 There were snow flurries at the time we started laying the AAC block. But the lot has been cleaned up, we just drilled 260’ to put in the well and are getting 12 gallons/minute, and we’re leafed out in the past month and looking forward to putting in a water element in the front of the house. Most of the landscaping will have to wait for Fall however. We’re going to avoid putting in a lawn by doing ground cover and water-resistant plantings, mulch, and some hardscapes. We've decided to hire someone from https://ziehlerlawncare.com to help with the landscaping. Coming up next week is the spray foam and drywall.